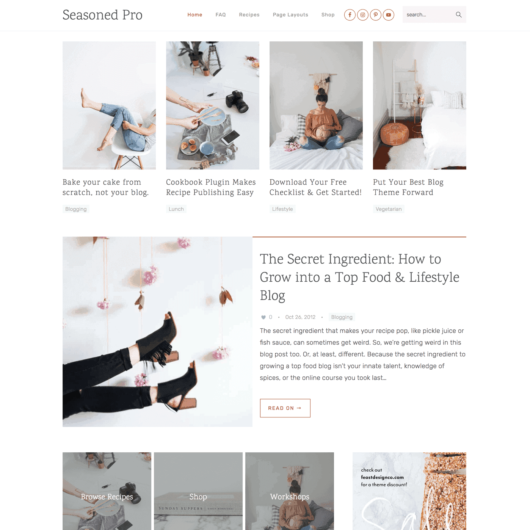 Foodie Pro - Food Blogger Wordpress Theme by Feast Design Co.
There’s a reason why Foodie Pro is the #1 selling Genesis child theme–it’s the most flexible Genesis Child Theme to date – with a minimalist style and plenty of color and typography options. There’s no need for built-in color schemes when you have the freedom to use whatever color you want! This Genesis child theme requires the Genesis Framework, which must be purchased separately. 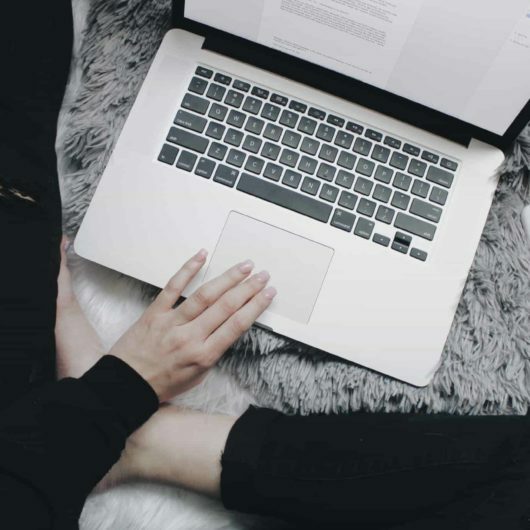 First impressions matter, especially when it comes to websites. You have a fraction of a second to make that first impression, and only 2-3 seconds to grab their attention with stunning food photography. Foodie Pro is here to make your content stand out and keep your visitors engaged. 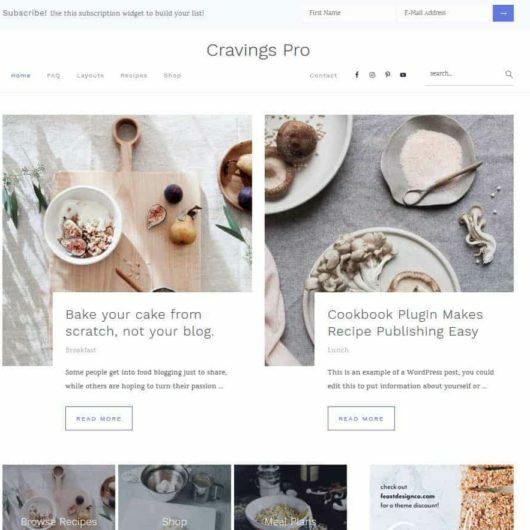 We know you’ll enjoy just how simple this theme is, with best practices built right in so that you don’t have to spend hours researching landing pages, conversion rate optimization, configuration settings, etc. Simply install Foodie Pro after Genesis, load in the demo content and start customizing! Clean. Crisp. Minimal. This is what we hear time and again from our customers. Foodie Pro is designed to be clutter-free, so that your visitors can focus on what’s important. Those delicious recipes you spend hours writing, baking, and staging for pictures. This keeps those beautiful pictures at the forefront, engaging your readers. Your visitors are likely looking up food recipes on their mobile devices – at work, at the grocery store, or standing in front of the fridge at home. Make sure that you’re putting your best foot forward with Foodie Pro. We’ve listened to your comments and suggestions over the years and have used them to design the most food-blog friendly theme out there. A combination of proper spacing with subtle colors keep the focus on the important stuff – the delicious recipes you’re creating, and witty commentary to go along with it. Get your web design out of the forefront, and let your content do the talking. 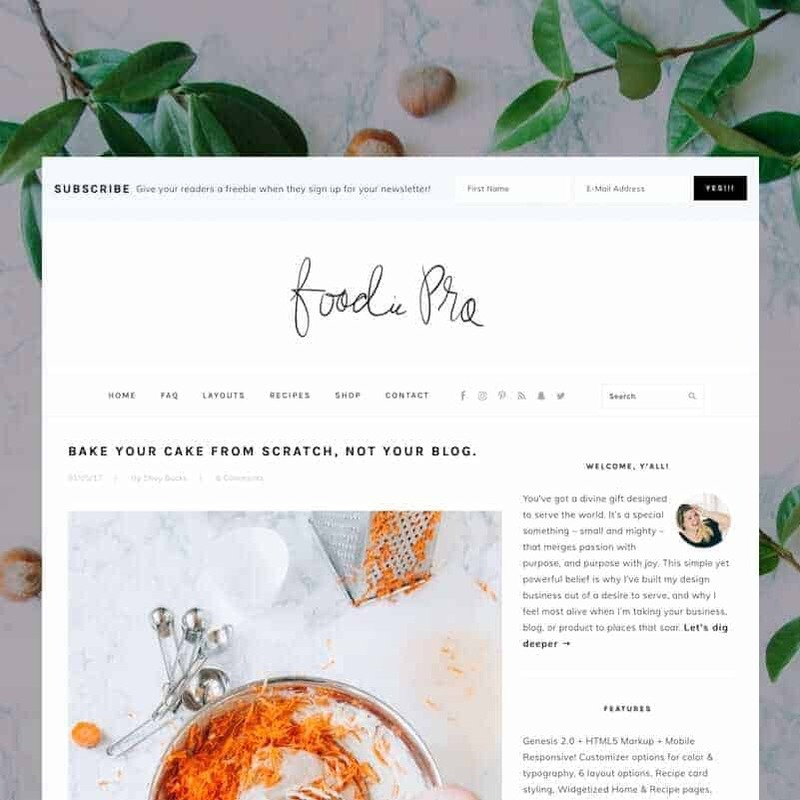 Updating your food blog theme to Foodie Pro is like going through a kitchen renovation – the end result is something that you could fantasize about but couldn’t quite fully picture. Once it’s done, everything is new and exciting, and blogging becomes a joy again. We have a dedicated support team to help you get your theme set up. Check out our helpful tutorials then submit a support ticket if you need additional assistance. Is this theme pagespeed compatible?